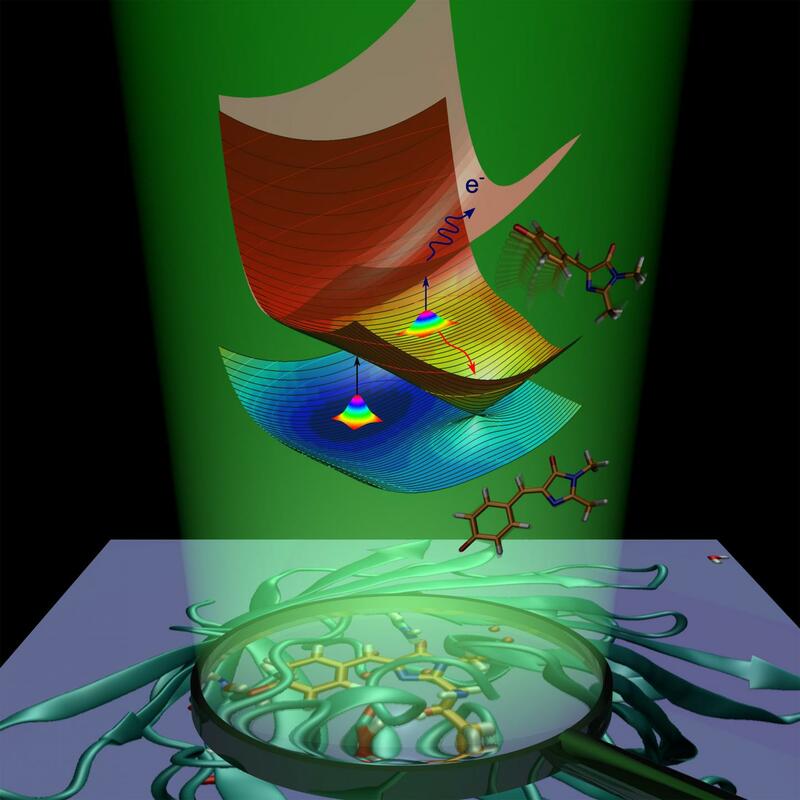 The members of the Faculty of Chemistry of the Lomonosov Moscow State University in cooperation with Danish molecular physicists have revealed the mechanism, determining the sensitivity of the green fluorescent protein to light exposure. The scientists have proved that an isolated chromophore group is capable of emitting light outside the protein environment, while the protein function is to enhance its fluorescent properties. The research has been funded by the Russian Science Foundation and the Villum Foundation, and the results are published in the Journal of the American Chemical Society. Proteins from the GFP family are widely used as biomarkers – with their help one could visualize various biological processes, taking place inside living cells. These proteins came into wide use in molecular and cellular biology due to their unique ability to fluoresce upon absorption of light of a certain wavelength. Only a small fragment of the protein chain (namely, a chromophore group or, shortly – a chromophore) is responsible for light absorption. The chromophore is formed by just three amino acid residues. Up to the present, the protein environment has been thought to make its chromophore emit light under irradiation. This idea has been supported by the fact that the isolated chromophore loses its fluorescent properties upon protein denaturation, i.e. unfolding of the protein. For the first time, the authors have predicted and experimentally proved that the isolated chromophore can also fluoresce outside the protein environment but only at temperatures below 100 ? (-173? ?). Following absorption of light, the fluorescent protein gains extra energy and undergoes transition to the electronically excited state. The protein molecule is striving to be back to the ground state by getting rid of the excess energy. This process is called deactivation and proceeds in two ways. The first one is fluorescence. In transit from the excited state to the ground one, the chromophore emits energy in the form of light, and as a result, the protein becomes luminous. The second way is called nonradiative relaxation. During this process electronic excitation energy, transferred to a molecule upon light absorption, is transformed into vibrational energy of nuclei. Internal conversion inside the green fluorescent protein is followed by a chemical reaction – cis-trans isomerization of the chromophore (i.e. intramolecular rotation about one of the double bonds inside the molecule). In case of the anionic (negatively charged) chromophore of the green fluorescent protein, energy can also be transferred to one electron, which leaves the chromophore. The chromophore, which undergoes isomerization or loses an electron, removes excess electronic energy and doesn't fluoresce. Fluorescence is called a radiative channel of deactivation, while internal conversion and electron emission are called nonradiative channels. The scientists have experimentally used both nonradiative channels to study the excited-state decay and the ground-state recovery of the isolated GFP chromophore at various temperatures. The scientists have shown that the isolated GFP chromophore can be trapped in the excited state due to the presence of intrinsic energy barriers along the nonradiative deactivation pathways. When the chromophore is cooled to 100 K, the trapping lasts for nanoseconds, thus enabling the slow radiative channel. The trapping barriers prevent the chromophore from returning to the ground state by fast nonradiative conversion and all that is left for the molecule is to fluoresce. Dr. Anastasia Bochenkova, Associate Professor at the Faculty of Chemistry, the Lomonosov Moscow State University and one of the authors shares: "The GFP chromophore is intrinsically fluorescent. Interactions between the chromophore group and the nearest protein environment improve conditions for trapping the chromophore in the excited state, thus enhancing the molecular fluorescence. As a result, the radiative channel becomes predominant inside the protein already at room temperature." The scientists have studied the chromophore properties both theoretically and expirementally. The scientists from the Lomonosov Moscow State University have elaborated a theoretical model and estimated an excited-state lifetime of the isolated chromophore, based on the performed high-level quantum-chemistry calculations. Such calculations require high-performance computing resources, and the scientists have used the Lomonosov Supercomputing Center for their studies. The Danish scientists have designed and created a new experimental technique for studying light-induced molecular dynamics of isolated charged chromophores in vacuo – femtosecond pump-probe action spectroscopy with 2D temporal resolution. Both delay time between two femtosecond (10-15 s) laser pulses and decay time of a particular molecular action were varied. The new technique has allowed to resolve the light-induced dynamics of the GFP chromophore as it happens in different decay channels through both the excited and ground electronic states, depending on temperature. Based on the obtained results, the researchers have made a conclusion that native GFP chromophores are intrinsically capable to fluoresce outside the protein environment with a nanosecond lifetime, fully supporting theoretical predictions. Anastasia Bochenkova concludes: "Our research aims at disclosing molecular mechanisms of functioning of living systems. A fundamental challenge is to understand the relasionship between the properties of an entire light-sensitive biosystem and its much smaller active chromophore, which is at the heart of the molecular machinery. Here, we have shown that the properties of a single chromophore are important for understanding the mechanisms of action of the entire GFP protein. The new knowledge has been obtained at the intersection of physics, chemistry and biology and results in revising the prevailing paradigm about the role of the protein environment in the fluorescence of the GFP protein. Beyong solving the question about the origin of the intrinsic fluorescence of GFP, the work shows that detailed molecular knowledge, obtained through high-level quantum chemistry calculations, may be used together with molecular engineering in designing new functional biomaterials with optimal photoresponse." The project has been carried out in collaboration with the group of Prof. Lars H. Andersen from the Department of Physics and Astronomy of the Aarhus University (Denmark).